The Turkish lira resumed its plunge on Thursday following a sharp rebound on Tuesday when Turkish authorities unleashed an unprecedented assault on lira shorts, helping push the TRY briefly higher ahead of regional elections, after a disappointing reading on the central bank’s net FX reserves stoked fears that the country was even closer to a full-blown currency crisis than investors had feared, while local accounts continued to accumulate foreign currency after overnight swaps on the Turkish Lira collapsed to just 40% from a historic high around 1,338% on Tuesday. 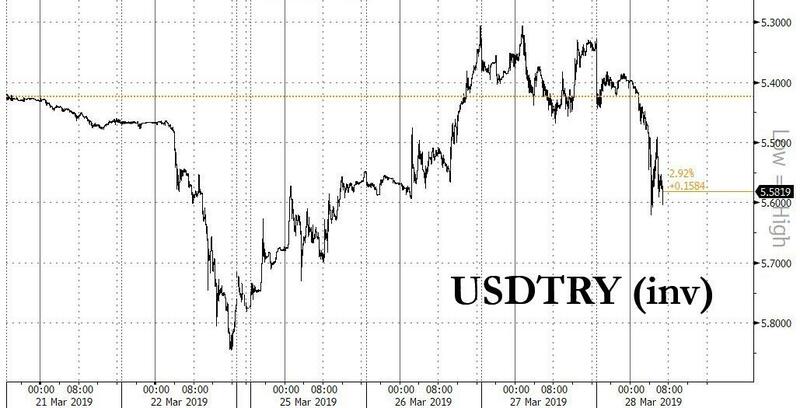 After nearly a week of chaos that one trader described as unprecedented in his two decades in the market (“I’ve never seen a move like this in the 21 years I’ve been watching the market“), it appears President Erdogan has relented, and following a vocal outcry from the international community which was effectively trapped in lira positions, both long and short, after overnight swaps hit rates well above 1,000%, on Tuesday the swap plunged as low as 18.5%, in line with recent historical prints, and an indication that after doing everything in its power to squeeze shorts (and longs) the central bank appears to have capitulated. 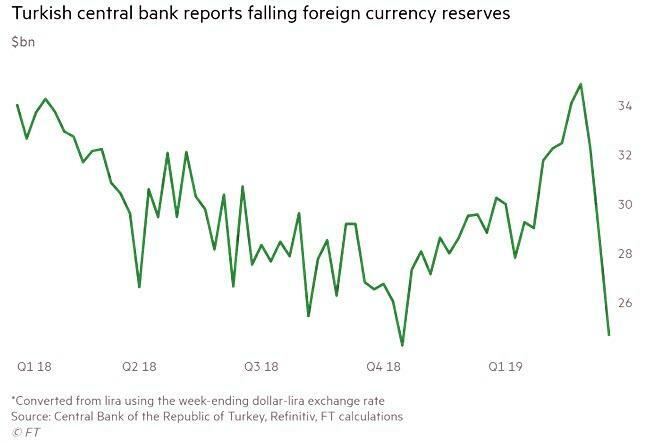 Meanwhile, the underlying pressures facing Turkey accelerated, and on Thursday data showed another dizzying drop in Turkey’s foreign exchange reserves brought the total decline for the first three weeks of March to 45.1 billion lira, or about $10 billion. According to FT calculations, Turkey has now burnt through at least a third of its foreign reserves this month in an effort to stem a plunge in the lira ahead of local elections at the weekend, putting the country on path to a full-blown currency and funding crisis. According to the central bank, reserves now stood at about $24.7 billion, down from $28.5 billion a week earlier, a 13% drop in one week. What is even more concerning than the collapse in reserves, however, is that even locals now appear to have lost faith in a currency which the government is forced to defend at any cost – literally – and on Thursday the Lira fell 5% to 5.5914 per dollar amid a sell-off that’s roiling the nation’s markets, as the very same measures designed to deter short-sellers from selling the currency before municipal elections on Sunday achieved the opposite outcome and spooked investors, both foreign and domestic. 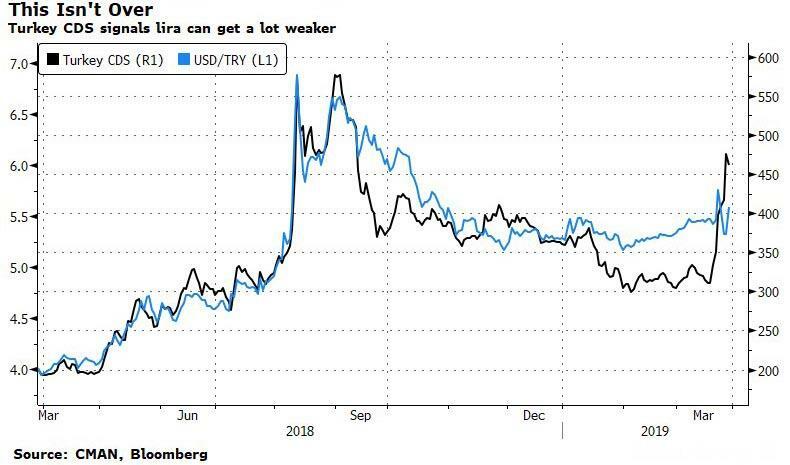 Meanwhile, as Erdogan has focused on the currency, other market indicators are screaming full-blown crisis and on Thursday, Turkey’s five-year credit default swaps widened for an eighth day to 462, the highest since September, while the yield on the nation’s benchmark 10-year lira bond jumped 91bps to over 19%. As Bloomberg notes, the cost of protection on Turkish sovereign notes has jumped above that for Iraq, Greece, Angola and Pakistan. Governments with costlier CDS include Ukraine, Argentina and Lebanon… for now. The turnaround in market perceptions for Turkey was especially striking because its CDS had been calmly declining even as the economy sank into recession. It wasn’t until recent fears about the plunge in reserves, that the CDS rout accelerated. If only assumes the historical correlation holds, the Turkish Lira will soon tumble to about 6.00 vs the dollar. 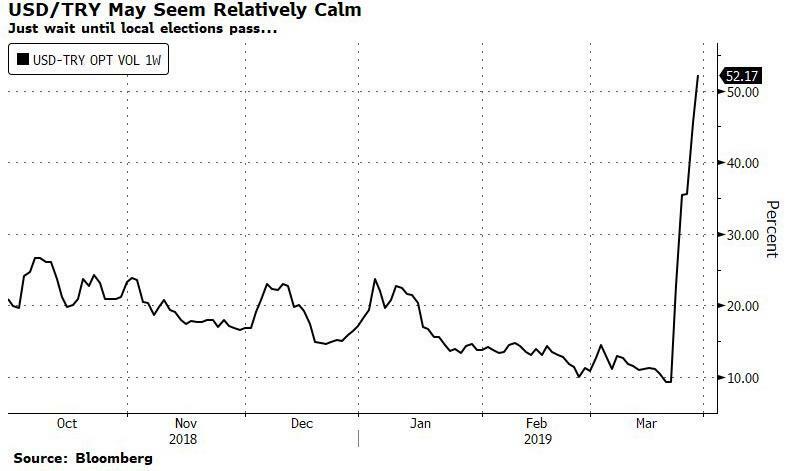 So with Turkey now once again in a full-blown financial crisis and this time with the added kicker of its reserves dwindling to dangerous levels yesterday’s quasi capital controls notwithstanding, traders’ attention turns to what happens next week after the local elections are out of the way. Adding to the comedy, the president said that a “cornering operation targeting foreign exchange and interest rates were foiled”, ignoring to add that as a result of this operation, the last trace of confidence investors may have had in his increasingly banana republic may have now evaporated.